Nasir's Eclectic Blog: JADDAN BAI, THE IMPERIOUS ARBITRATOR OF BOLLYWOOD! 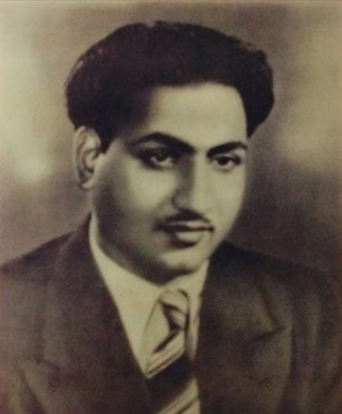 This Blog is mainly a Tribute to the Legendary Indian Playback Singer, Mohammed Rafi (1924-1980) whose rich tonal voice, crystal clear intonations, versatility, along with his unique renditions of the soul-uplifting, heart-wrenching, and breezy songs in thousands, continue to attract the older and the newer generations day by day. This Blog transliterates and translates his songs into English for wider appreciation. The Blog will also publish posts on his life and times, and on other topics. JADDAN BAI, THE IMPERIOUS ARBITRATOR OF BOLLYWOOD! Without going into the antecedents of Jaddan Bai (1892-1949), it is enough for our purpose to know that she was a woman of many talents: classical singer, dancer, film producer-director, actor and composer. She was born in Banaras grew up in Allahabad. She was a disciple of the noted music masters and classical singers of the day such as Ustad Barkat Ali Khan, Ustad Umrao Khan, and Ustad Moizuddin Khan from whom she learnt the Thumri. Once K.L. Sehgal heard her at Calcutta and was all praise for her. One of her non-filmi Thumris include, Lage karajwa me.n choT/Phool gendwaa na maaro – which surely reminds us that the song of Manna Dey’s Phool gendwaa na maaro from Dooj Ka Chaand (1964), which was lip-synched in the background of comedy by Agha, had been inspired by Jaddan Bai’s Thumri. Her mastery of classical idiioms can be guaged from her renditions of the Roop Joban and Tere Sang Raja too. Jaddan Bai lived during the era when Dada Saheb Phalke made his first silent movie, Raja Harishchandra (1913) and went on to see the transformation in 1931 when the first talkie, Alam Ara was released and many actors of the silent movies lost their jobs. Those were the musical times when the sound system gave great impetus to the songs in the movies so much so that Indrasabha (1931) had 71 songs to boast of. That was also the age of Gramophone Singers and Jaddan Bai was one of them. As such we have the treasure trove of songs of those “gaanewaalis” whose songs were recorded for common public’s consumption. No longer were they the preserves of the Rajas’ Darbars. Jaddan Bai thrilled the listeners with Thumris and Dadras through the gramophone records and over the radio. In his Come Fire, Come Rain, Khalid Hasan fondly recalls that Jaddan Bai was the toast of many princely states . He further mentions that a number of her ghazals and songs have been preserved in the Classical Musical Cell that was established by Faiz Ahmed Faiz at Lahore. She witnessed the formations of the studio-systems when each studio had its film producer, directors, technicians, actors, singers, story-writers, and music directors. The Imperial Studios, Bombay Talkies, Prabhat Films, New Theatres, Wadia Movietone, Ranjit Studios, Minerva Movietone and Madan Theatres flourished during that period. Of course, she wouldn’t live long enough to see the downfall of this system that began with the mid-Fifties when most of the production houses merely became avenues for production of all sorts of movies. In 1935, when JBH Wadia produced Hunter Wali and R.C. Boral introduced the first playback singing in Dhoop Chhaon (1935), Jaddan Bai acted in and composed music for Talaash-e-Haq (1934-1935). She launched her company Sangeet Movietone in 1936. Jaddan Bai directed Madam Fashion and Hriday Manthan (both 1936) and Moti Ka Haar and Jeevan Swapna (1937). She acted in Raja Gopichand, Insaan Ya Shaitan (both 1933), Seva Sadan and Prem Pariksha (both 1934). Shahi Rakkasa was one of her earlier movies. In Madam Fashion, she was also the actor, lyricist and music director. Though some sources point out Jaddan Bai or Saraswati Devi alias Khorshed Homji in Jawani ki Hawa (1935) as the first female music director in the Indian film industry, it is Ishrat Sultana (Adl-e-Jahangir – 1934) who takes that credit. In passing, it is interesting to note that the Parsi Panchayat had taken a strong objection at the instance of four Parsi members who were on the Board of Bombay Talkies, to a Parsi female composing music for a movie and another sister of hers (Chandraprabha alias Manek) acting or singing in a movie and the Parsi community had even even taken out a 'morcha' to stall their movies in 1935. Now Jaddan Bai, having seen the ravages of time and coming from the “Tawaif” background, was sympathetic to the plight of the ‘Tawaifs’ or courtesans and this reflected heavily in her movies. The Tawaifs were the persecuted lot ever since the Britishers launched a vigorous movement against them 1890 onwards and the days of the Raja and the Maharajas and even the nawabs were drawing to a close. Jaddan Bai cared well for her single mother, Daleepabai. Evidently, Jaddan Bai was far-sighted enough and so in Talaash-e-Haq, and Madam Fashion she cast her own daughter, Kaneez Fatima Rashid, as Baby Rani who was to reach the filmy stardom within the next seven years as Nargis (b.1929-d.1981) – the name given by Mehboob Khan . Nargis' father was Uttamchand Mohanchand who had converted to Islam before marrying Jaddan Bai was named Abdul Rashid by Maulan Abul Kalam Azaad. He hailed from Rawalpindi, and as a medical student had met Jaddan Bai at a Lucknow hospital where she had been admitted for a surgery. It was the case of love at first sight. It is well to remember though that Jaddan Bai was not enamoured of the riches of Mohan Babu. Rather, as Manto says of Mohan Babu’s riches: ‘yeh sab daulatein Jaddan Bai ke dar par bhikari ban gayeen’. Such was the charm of Jaddan Bai! Manto has a sharply drawn sketch of hers in his Ganjey Farishtey, in the section on Nargis. Jaddan Bai had other children too by her previous marriages and their names were Akhtar Hussain and Anwar Hussain. The latter acted in many Hindi movies and was a renowned character artiste and villain. The former is more known for writing the story of Raat Aur Din (1967) which won a National Award for Nargis. Today, Jaddan Bai is remembered as the grandmother of Sanjay Dutt. Before her death in 1949, Jaddan Bai witnessed the tremendous achievements of her daughter and her successful pairing opposite Motilal and Chandramohan (Taqdeer), Ashok Kumar (Humayun), Dilip Kumar (Mela, Anokhi Ada and Andaz) and Raj Kapoor (Aag, Barsat and Andaz). By 1949, Nargis found a stiff competition from a new galaxy of female actors such as , Kamini Kaushal, Madhubala, Suraiya, Munawwar Sultana, Mumtaz Shanti, Nimmi, Geeta Bali and the upcoming Meena Kumari. At this time, Jaddan Bai produced Daroga Ji, casting Nargis as the heroine. Against the establishd norm, Jaddan Bai introduced a new singing voice for her daughter. This was Geeta Roy who sang ten songs for Nargis! For the reasons pointed out above, Jaddan Bai was not fated to see her daughter’s best performance in the title role of Mother India (1957) for which she won international recognition and the Best Actress Award at the Karlovy Vary Film Festival and which also fetched her the Filmfare Award at home. Nargis also starred in the Indo-Soviet co-production, Pardesi (1957) and a decade later in a Greek movie, Tosa oneira stous dromous (1968). While the above facts are a matter of common knowledge, what many don’t know about Jaddan Bai is that besides being a woman who loved poetry and presided imperially over her family, she was also a woman of sagacious judgment. The film-wallahs used to flock to her home to settle their mutual differences and quarrels. Her say was final and there was no appeal after her judgment! The following account, involving A.R. Kardar and Mehboob Khan, was narrated by Akhtar-ul-Iman (dialogue-writer of Waqt fame) to my friend, Sayyad Saab, when the latter visited him at his old flat at the Bandra Bandstand in Nineteen Eighty-Four. In Hindi film industry, who doesn’t know Mehboob Khan and A.R. Kardar! Briefly, A.R. Kardar (1904-1989) began as actor and then made his directorial debut in 1929 with Husn Ka Daku aka Mysterious Eagle. He directed almost 40 movies, 15 of which were in the Nineteeen-Thirties itself, and went on directing movies till the mid-Sixties. His last one was in 1975 (the inconsequential Mere Sartaj, starring Zaheera). His very famous ventures include Pehle Aap (1944) Shahjahan (1946), Dard (1947) which he also produced, Dulari, (1949), Dillagi (1949), Dastaan (1950), Jadoo (1951), Deewana (1952) Dil-e-Nadaan (1953) Yasmeen and Baap re Baap (1955), and many others. One of his last movies as the Director was Dil Diya Dard Liya (1966) though rumour has it that it was ghost-directed by Dilip Kumar, the hero of the movie. He was the owner of the Kardar Studios. As for Mehboob Khan (1907-1964), before he joined the film industry he used to fix horse-shoes. Thereafter, he became a spot-boy in film industry. Gradually, from doing bit roles, he rose in rank and became a film-director with Judgment of Allah (1935). He directed Taqdeer (1943) where he launched the 14-year old Nargis as his heroine opposite Motilal. How he roped in Nargis is also an interesting story. It is common knowledge that Nargis had a desire to become a doctor – while the fate conspired to make her an actor. Nargis used to feign sickness rather than attending her shooting assignment for Taqdeer. Anyway, pushed on by her mother, Jaddan Bai, she at last consented to accept the lead role in Taqdeer though she had previously done Tamanna (Desire). He directed many movies but still remained discontent since he had no production banner of his own. Yakub – the famous all-round actor of the Nineteen Forties-Fifties - advised him to pay a visit to the shrine of Khwaja Moinuddin Chishti which he did. Soon thereafter he parted ways with Sagar Movietone and National Studios. He founded his own Mehboob Productions in 1943. The list of his movies are too well-known to name them here. His Mother India (1957) was selected for Academy Award for the best foreign language film, and also got him the Filmfare Award for Best Director; while his Aan (1952) is forever ingrained in public memory for its colourful extravaganza and swashbuckling adventure and romance that was the envy of Hollywood. Now A.R. Kardar and Mehboob Khan were related to each other by their marriage to the Akhtar sisters: The former was married to Bahaar Akhtar and the latter to Sardar Akhtar. In Urdu parlance, they were “ham-zulf,” or “Saa.Doo Bhai” which in English loosely means they were the brother-in-laws of each other. 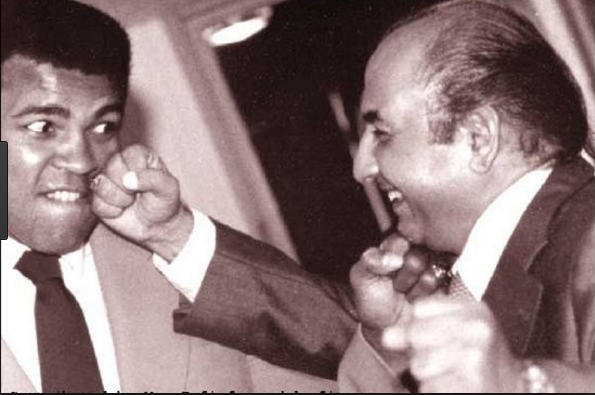 At one time, Mehboob Khan and A.R. Kardar were involved in some mutual quarrels and bickerings, backed by their respective supporters in the film industry. Since an amicable settlement was nowhere in sight, both of them requested Jaddan Bai to solve their problem. Jaddan Bai fixed the date of hearing. On the fixed date, A.R. Kardar and Mehboob Khan made their way to the home of Jaddan Bai on Marine Drive. They were accompanied by their supporters. There they sat on the floor of the hall which soon began to look like a court-room where the parties come for judgment. There was lot of noise as the supporters were blaming one another. A maid came and announced that Jaddan Bai was on her way to the hall. There was a hushed silence. Soon Jaddan Bai occupied a sofa and looked about. She appeared as a Daniel come for Judgment. The petitioners were seated to her left and right in the front. Everyone, including A.R. Kardar and Mehboob Khan, acknowledged her presence and sat with their heads bowed. Jaddan Bai looked at each of them. “Mehboob tum chhote ho na? Raashid tum ba.De ho na?” They nodded their head in affirmation. “Mehboob tum shuru karo,” she told him. Mehboob Khan was a bit nervous. Besides, he could not speak proper Urdu or Hindi. Remember that he hailed from a small village in Gujarat and had had a very humble beginning. He requested her that he may be represented by one of his supporters. The request was granted. She heard Mehboob Khan’s petition patiently. Jaddan Bai looked at Mehboob. “Tumne Raashid se is baat ka khulaasa kiya thaah Mehboob? Mehboob Khan shook his head in denial. Thereafter, Jaddan Bai remained silent for a considerable time, contemplating over the matter before her. No one in the room made even a whisper. Finally, she broke her silence: “Yeh aapas me.n achchee baat nahee.n.” With that introductory remark she began spelling out her judgment. She gave the judgment in favour of A.R. Kardar. After “Aapa” had pronounced the final verdict, she asked both the parties if they had anything to say further in the matter. No one dared to utter a word. Mehboob Khan and A.R. Kardar got up. Their heads still bowed, they made a salaam and quietly they left the premises of Jaddan Bai. Their supporters followed suit. The parties were at peace thereafter. Such was the respect Jaddan Bai enjoyed in the film industry! Such was her clout! Very informative blog, Nasir bhai. Thanks a lot Nirmal bhai. TIME TO CHANGE THE GENRE OF THE SONGS! FROM ONE CHAMP TO ANOTHER! SO ASHA PAREKH DOESN'T LIKE DILIP KUMAR! A REVELATION INDEED! DILIP KUMAR'S THOUGHTFULNESS AND RESPECT FOR HIS MOTHER-IN-LAW, NASEEM BANU (REVISED). 41. Translation of Rafi Song: Aaj Mausam Bada Beimaan Hai..
92. Romantic Song of Rafi Song: Apni Aankhon Mein Basaakar..
Peppy Songs of Mohammed Rafi. 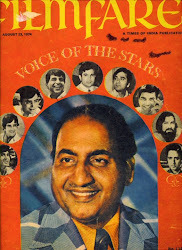 HAPPY BIRTHDAY REMEMBRANCES AND TRIBUTES TO LEGENDARY MOHAMMED RAFI SAHAAB. The Legendary Indian Singer for All Times. MANY THANKS FOR VISITING NASIR'S ECLECTIC BLOG! I APPRECIATE IT A LOT! Jahan Ali -Upcoming Model & Actor. Disclaimer: All data and information provided on this site is for informational purposes only. www.nasir-eclectic.blogspot.com makes no representations as to accuracy, completeness, currentness, suitability, or validity of any information on this site and will not be liable for any errors, omissions, or delays in this information or any losses, injuries, or damages arising from its display or use. All information is provided on an as-is basis. The opinions expressed on this webpage do not necessarily reflect the editorial position of this Blog. This site contains copyrighted material the use of which has not always been specifically authorized by the copyright owner. 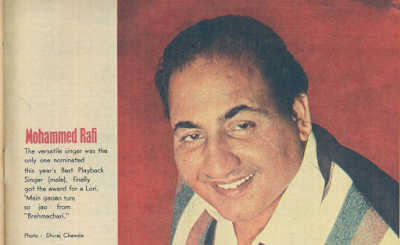 We are making such material available in our efforts to advance understanding of the lyrics of Hindi-Urdu songs of Late Mohammed Rafi and articles on his life and times, for the benefit of English speaking public. The blog also has Islamic articles and articles on other subjects purely for educational purposes. We believe this constitutes a 'fair use' of any such copyrighted material as provided for in relevant sections of the relevant Copyright Laws specific to the individual countries. The material on this site is distributed without profit to those who have expressed an interest in said material for research and educational purposes. If you wish to use copyrighted material from this site for purposes of your own that go beyond 'fair use', you must obtain permission from the copyright owner. Copyrighted articles. Picture Window theme. Powered by Blogger.